Thank you for your interest in Regency Park Apartments. Our 2-bedroom townhome features 1,728 square feet of living space and rents for $875.00 per month. All of our townhomes have 3 floors and your own private entry. The main floor features the living room with a natural fireplace, dining room, kitchen and ½ bath. Off the living room is a private balcony. This floor plan offers a fully equipped kitchen with garbage disposal, dishwasher, frost-free refrigerator and gas stove. The 2nd floor has 2-bedrooms and the full bath. Both bedrooms offer a full wall of closet space. There is also an additional storage closet in the main hallway on the 2nd floor. The full bath features a separate dressing area with double sinks. Some of the basements are fully finished. 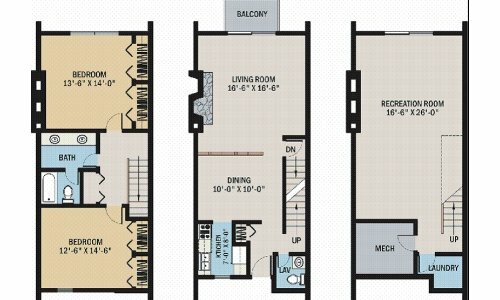 Which can be used as an extra living room or 3rd bedroom. Each basement also offers washer and dryer hookups and a walkout patio. With our townhomes residents are responsible for all utilities. All townhomes are cable ready. Carports are also available.